Erin and Chad Paine had a difficult weekend. On Friday, Brooklyn Paine's finger started swelling, and she soon began running a fever. Doctors conducted multiple tests and administered antibiotics, but the problem worsened. 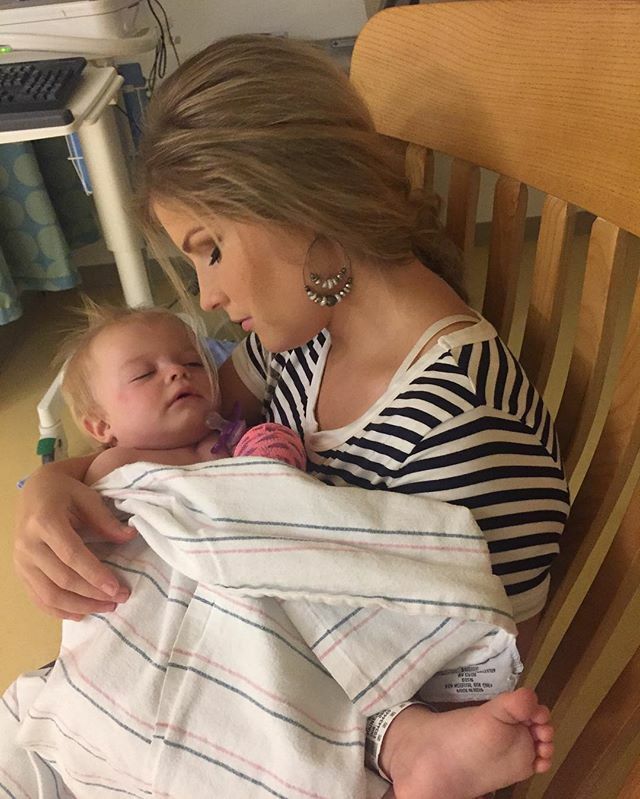 Brooklyn ended up having surgery to release pressure yesterday morning, and the Paines say she is recovering well. We know Erin and Chad would appreciate your prayers as they wait on lab results and care for their sweet baby. Brooklyn will turn one year old on August 6th. 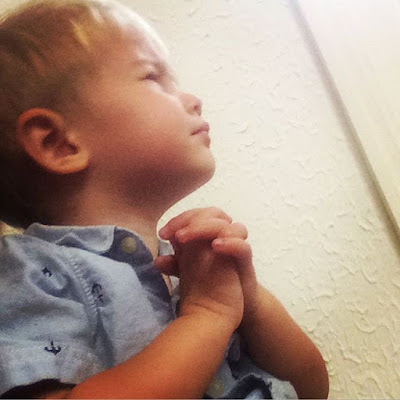 Big brother Carson Paine is praying too! I am praying fervently for complete healing and for the entire family during this time. God Bless The Cubbage family. Praying for baby girl, mom and dad and all the staff involved in her care. Dear Jesus please be with this family. Praying for Brooklyn and her mommy and daddy! What a good big brother you are Carson!!! I'll pray for sweet Brooklyn. How scary for them! Yes, praying for our Lord's healing touch and loving hand. Bates your programs are an inspiration and a blessing. Thank You! One who walks with HIM. Sending healing prayers for Brooklyn and prayers of peace for Mom and Dad. God is able! Prayers for you and yours..God bless..
Father God be with this young family in Your Name Amen! Sending prayers to baby Brooklyn and family. Praying for for the family and hope she's feeling better soon. Sending prayers for her healing!! Praying for Brooklyn and her family. Sending healing prayers for your precious little one. Healing prayers for their precious baby girl. There is nothing worse then your child sick or hurting & you can't help. Prayers for all! It is so hard to see our children hurting or sick & not able to take away theor suffering. Prayers are sent out for Brooklyn & her family. OFFERING PRAYERS for Brooklyn to have a complete recovery!! And praying for Mommy, Daddy, Carson, and the entire Bates family!!!!! May God be with each and every one of y'all. Praying for little Brooklyn,may she have a fast recovery and may the Lord bless her with his healing power. May the Lord God lay his healing hands upon Brooklyn. Amen! PRAYING WITH VIGOR AND FAITH!!!!!!! Praying for Brooklyn and family. Oh my. Praying for sweet Brooklyn. I am keeping the whole family in my prayers, God bless. Praying for healing for your sweet baby girl, and for strength for momma and daddy! Praying for a speedy recovery. God bless this beautiful family. I'm praying for the doctors to have wisdom and for total healing and comfort, but wondered if we have any details on what's causing this? Praying for you. So sorry to hear this. God bless you little Brooklyn. I Love Erin, she is so wonderful. Praying for Brooklyn's healing, for wisdom for the doctors to know what's going on and how to treat her, and for peace for the parents and big brother. Prayers for little Brooklyn,for your family, and for wisdom for the doctors treating her! Praying for your precious daughter, as well am praying for your family. God bless little Brooklyn! Blessing to the entire family!!! Sending lots of love and prayers! Prayers for Brooklyn and her family. Praying for the sweet baby girl. Also for Mommy, Daddy and Carson. I stood there in shock as my two year old daughter lay under the vehicle of a conversion van. My church and everyone prayed for a miraculous recovery. God answered. God guided the doctors hands through the surgeries. I am a believer in prayer. May God touch little Brooklyn. For God knows the situation; I believe in answered prayers. My little girl is now 20 years old. She won't stop running and is unstoppable. Because God answered the prayers. I pray your family is comforted, and health is restored to a darling angel Brooklyn. We will keep your sweet family in our prayers. I am so sorry to hear this. Praying for their precious little doll Brooklyn. May God watch over her and may Erin and Chad feel comfort from the Lord. I pray she will be much better soon. Very scary to have that happen to your baby. We will keep your family in our prayers, Blessings. Our prayers are with your family. God is with Brooklyn. Give her a big hug. Praying for your family.God Bless. We are praying too. For dicernment and wisdom for the doctors and a peace that passes understanding for the parents. Praying for sweet Brooklyn and family. Sending prays for little Brooklyn and the family. Praying also for a quick recovery. Praying for full and complete healing for baby Brooklyn. I am praying for your sweet family. Praying for this sweet baby girl. Ellie, any update on how Brooklyn is doing? I too am praying for Brooklyn's healing & peace for the entire family. It is so difficult to watch children be ill or injured. Praying for Brooklyn. Hope she is going to be ok.
Praying for Brooklyn and the family. Oh poor baby girl! MAY God be with the family and may God give the answers needed for the test results. Be with her and her family.